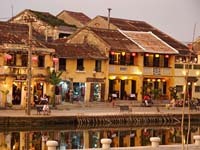 Vietnam is the paradise for any tourist who wants to have a wonderful trip. 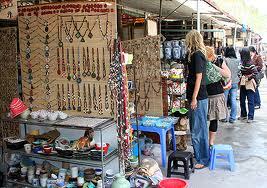 The diverse and unique cultural features combine with natural landscape will attract you. Viet Nam's diverse natural environment, geography, history, and culture have created a great potential for the tourism industry. 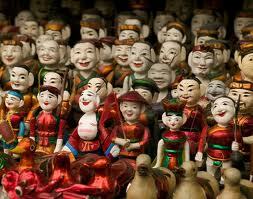 Viet Nam consists of long coastlines, forests, and mountainous regions with numerous magnificent landscapes. As well, Viet Nam has a long history and diversified culture with variety of ancient architecture constructions, and wonderful legends. Viet Nam has a long coastline that extends along the eastern mainland boundary and wraps around the southern tip for 3,260 km, a distance geographically longer than the length of the country. With 125 beaches, of which almost of all are beautiful beaches and convenient for tourism but not every country can have. Traveling from north to south, many famous beaches will be found such as Tra Co, Ha Long, Do Son, Cat Ba, Sam Son, Cua Lo, Thien Cam, Lang Co, Da Nang, Nha Trang, Ca Na, Mui Ne, Vung Tau, Ha Tien, Phu Quoc... 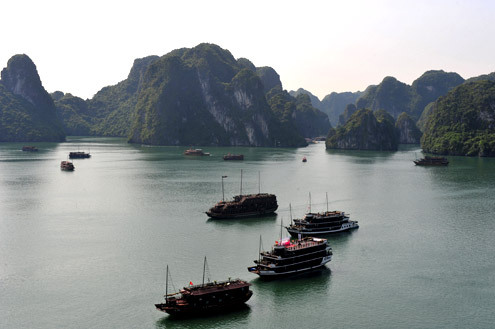 Especially, Ha Long Bay, a creation of Mother Nature which is recognized as the World Natural Heritage Site by the UNESCO twice in 1994 and 2000 for its natural beauty and geological value and now provisionally listed among the new seven natural wonders of the world. In addition, three bays including Ha Long, Nha Trang, Lang Co are members of the Club of the most beautiful bays of the world. Moreover, many beaches and islands are voted by worldwide prestigious news agencies, magazines, guidebooks with impressive titles such as Da Nang Beach voted by Forbes magazine (USA) as one of six most beautiful beaches on the planet in 2005; Bai Dai (Dai Beach) in Phu Quoc voted to be among the world's five best hidden beaches by the ABC News in 2008; Con Dao selected as one of the most impressive destinations in Southeast Asia in 2010 by the New York Times magazine. Specifically, in 2011 Con Dao listed in the top 20 most mysterious islands in the world of Travel and Leisure magazine (USA) and was voted as one of 10 best and mysterious islands in the world to enjoy a romantic holidays by Lonely Planet travel guide (UK). The sea reservations in Phu Quoc and Con Dao are home of dugong, one of the extremely rare species in the world. Beach lovers can enjoy exciting activities and water sports at almost of all beaches. With a large space of coastal lines of thousands islands nearing the mainland and archipelagos of Hoang Sa (Paracel Islands) and Truong Sa (Spratly Islands), sea and island tourism with specific products, has played an important role in the Viet Nam's tourism development strategy. Viet Nam is a tropical country in the northern hemisphere. With its geographical diversity, the country has inherited many famous natural tourist sites such as Sa Pa, Tam Dao, Bach Ma, Ba Na, Da Lat... These sites are usually located 1,000 meters above sea level; therefore, they have climates that are similar to those of the temperate zones. Sa Pa Town is attractive with old French style villas and modern buildings interspersed in peach garden and very green lines of sa mu (cunnighamia konishii). 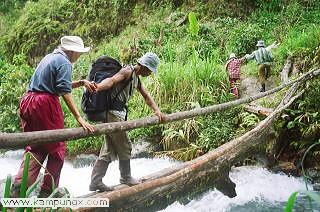 Especially, Sa Pa Town was voted one of the world's top ten places for walking by popular Lonely Planet guidebook. The road will take you to integrate into local life among terraced rice fields and villages nearby. 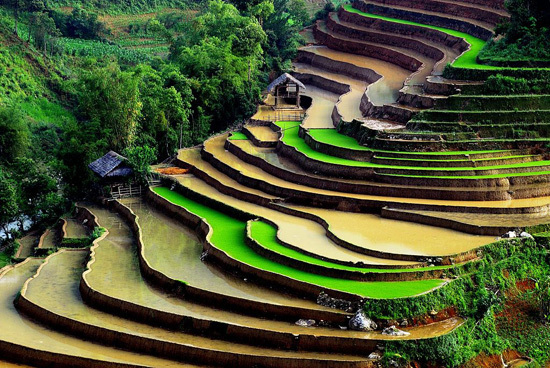 Moreover, the Sa Pa beautiful terraced rice fields along mountain sides, winding along the roads have been announced as one of seven most beautiful and spectacular terraced rice fields in Asia and the world by Travel and Leisure magazine (the United States). Da Lat is an ideal tourist area, famous for pine forests, waterfalls and many kinds of beautiful flowers. Coming to Da Lat, tourists are diverted by the strong and tender melodies of the T'rung and Gongs, two typical musical instruments of the highlanders commonly played at evening parties. Besides, Viet Nam has 30 national parks and many nature reserves which are great collections of precious plant and animal species of the tropical zone. Especially, Phong Nha - Ke Bang National Park with its vivid evidences of the Earth's formation, geological, topographic and geomorphologic history, mysterious landscapes and the bio-diversity of the national park as well as its unique historical and cultural values, has been declared a world natural heritage by UNESCO in 2003. Phong Nha-Ke Bang is home to the largest cave in the world and 300 different grottoes and caves. Phong Nha Cave has been regarded by British Cave Research Association as the top cave in the world due to its 4 top records: the longest underground river, the highest and longest cave, broadest and most beautiful fine sand beaches inside the caves, the most spectacular stalagmites and stalactites. Son Doong Cave has been recognized as the largest natural cave in the world. In addition, up to 2011, there are 8 world biosphere reserves recognized by UNESCO in Viet Nam including Cat Tien National Park (now known as Dong Nai biosphere reserve) (2001), Can Gio mangrove in Ho Chi Minh City (2000), Cat Ba Island in Hai Phong City (2004), Red River Delta (coastal wetlands of the three provinces of Thai Binh, Nam Dinh, Ninh Binh) (2004), sea island and coastal of Kien Giang (2006), Western Nghe An (2007), Cu Lao Cham in Hoi An - Quang Nam (2009), and Ca Mau Cape in Ca Mau Province (2009). Four national parks recognized as ASEAN heritage parks include Hoang Lien, Ba Be, Chu Mom Ray and Kon Ka Kinh. There are several regions in Viet Nam that have been reserved as bird gardens and sanctuaries. At Tam Nong Bird Sanctuary, there is a garden conservatory for redhead cranes, established as an information center for cranes funded by the International Fund for Bird Protection in Bergheim, Germany. Viet Nam has abundant mineral water sources found throughout the country, such as Quang Hanh hot stream in Quang Ninh Province, Kim Boi mineral spring in Hoa Binh Province, Bang mineral spring in Quang Binh Province, Hoi Van mineral spring in Binh Dinh Province, Duc My and Thap Ba hot springs in Nha Trang City of Khanh Hoa Province, Vinh Hao mineral spring in Binh Thuan Province, and Binh Chau - Ho Coc in Ba Ria - Vung Tau Province... These areas have become destinations for health rehabilitation and relaxation attracting numerous tourists every year. Viet Nam has a long 4,000-year history, over which many valuable architectural monuments of typical oriental culture have been built. Many of these vestiges maintain their ancient appearances, such as the One Pillar Pagoda, Kim Lien Pagoda, Tay Phuong Pagoda, Tay Dang Temple and Chu Quyen Temple in Hanoi, Pho Minh Pagoda-Tower in Nam Dinh Province, Binh Son Tower in Vinh Phuc Province, Keo Pagoda in Thai Binh Province, But Thap Pagoda and Dinh Bang Temple in Bac Ninh Province, Cham Towers in the provinces of the Central Coast of Viet Nam and the royal architectures of Hue Citadel. Up to December 2011, there are more than 3,000 relics and landscapes classified national heritage, 10 special national relics out of tens of thousands of historical - cultural sites and landscapes in Viet Nam. Besides the two above world natural heritage sites, UNESCO recognized five world cultural heritage sites: Central Sector of the Imperial Citadel of Thang Long - Ha Noi, Citadel of the Ho Dynasty, Complex of Hue Monuments, Hoi An Ancient Town and My Son Sanctuary; six in the world intangible heritage lists: Nha Nhac - Vietnamese Court Music, the Space of Gong Culture in Central Highland, Quan Ho Bac Ninh folk songs, Ca Tru singing, Xoan singing of Phu Tho Province and Giong Festival of Phu Dong and Soc Temples (Hanoi); two in the World Documentary Heritage list: Woodblocks of Nguyen Dynasty, Stone steles in Van Mieu - Quoc Tu Giam (Hanoi). Besides, Dong Van Karst Plateau is member of Global Geopark Network. In the future, a number of cultural and natural heritage sites will continue to be proposed for the UNESCO's recognition. In addition, tens of millions of valuable antiques and national treasures are being preserved and on display at the system of 125 museums distributed all over the country. Also, the traditional festivals, custom, arts performances, handicrafts, gastronomy, costumes... of the community of 54 ethnic groups have been becoming the important tourism resources. 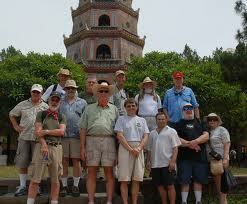 We are the first travel agent in among of Vietnam Travel system.